This is a refined landscape of century-old oaks, lofty pines and scenic Florida wetlands. At the core of it is a championship course honored as one of the Top 100 in the U.S. by GOLF Magazine. Send me more information about The Concession! The one-time competitors joined forces to design a classic course. This championship layout takes its name from one of the most historic moments in Ryder Cup history, when Nicklaus conceded a crucial two-foot putt to Jacklin at Royal Birkdale in 1969, resulting in the first tied Ryder Cup ever. Send me more information about The Concession! The sporting gesture that sealed the Ryder Cup tie. Complementing the 18 holes is one of the world’s largest private practice areas. Golf Digest ranks the complex one of the “75 Best Practice Areas in the U.S.” Featuring 23 acres, the practice facilities include a dual-ended driving range, 10,000 square-foot putting green and 14,000 square-foot chipping green. Luxury details create a comfortable and welcoming clubhouse. 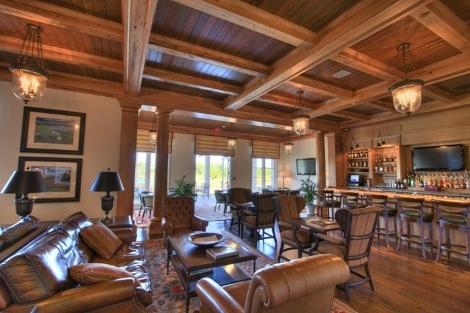 The clubhouse at The Concession embodies timeless tradition and prestige. Set among towering oaks, it serves as the social center for members and their guests. Spacious verandas and voluminous windows offer optimum views of the course and shimmering lake. Within the clubhouse are comfortable meeting rooms, casual and formal dining areas, card rooms, and an extensive pro shop. The men and women’s locker rooms have been outfitted with everything a serious golfer requires. Send me more information about The Concession! Everything, right down to the luxury locker rooms, has style. Paying homage to the traditional values and history of golf, the clubhouse is filled with memorabilia of legendary golf personalities, events and tournaments including the 1969 Ryder Cup match from which The Concession derives its unique character. Every element of its interior spaces was selected by renowned designers Adrienne Vittadini and Pamela Hughes, whose work produced a club facility on the cutting edge of style. Members will discover and delight in memorabilia of legendary golfers. Members experience the finest in dining at The Concession Bistro, offering a variety of exceptional culinary services. It has been honored with an invitation by the James Beard Foundation to host a performance dinner at the Beard House, the equivalent of culinary Oscars. For visiting guests, the community now offers The American & European Casitas and Cottages as well as the Lodge. Each cottage has four bedrooms and bathrooms as well as a half bath in the common area. Each casita is a large one-bedroom unit with a large bath. The Lodge consists of eight bedrooms and eight bathrooms plus a half bathroom in the common area. These structures have views of holes No. 9 and 10 and are located next to the Clubhouse. Send me more information about The Concession! The community is enhanced by the distinctive architecture of its custom estate homes, crafted by a select group of renowned builders. Send me more information about The Concession! The Concession is located along the border of Sarasota and Bradenton, just 3 miles east of I-75. Only 1 hour south of Tampa, the community is convenient to all that the Sarasota region and Tampa Bay area has to offer. With world-renowned beaches, a thriving arts community, and a simply relaxed atmosphere, Sarasota County offers something for everyone. Send me more information about The Concession! Sarasota is recognized as Florida’s Cultural Coast, and is home to a professional symphony, ballet, and opera. Several theaters and art galleries are also located in Sarasota. The John & Mable Ringling Museum of Art is Florida’s State Museum, and the Van Wezel Performing Arts Hall, known for its architecture and great acoustics, seats 1,700 people and features a dazzling season of music, shows, and programs for all ages. Visitors to the area can visit The Ringling Museum, Children’s Garden, Big Cat Habitat, Mote Marine Laboratory, Historic Spanish Point, Marie Selby Botanical Gardens, Sarasota Jungle Gardens, and more. Send me more information about The Concession! Myakka River State Park which covers 28,875 acres and Oscar Scherer State Park are big draws. They are Sarasota’s destinations for bird-watching, biking, walking, camping or just communing with Florida’s natural setting of swamps, palmetto brush and towering pine trees. Myakka State Park also offers guided boat and train tours that include informative narration of the area’s wildlife and history. Send me more information about The Concession!